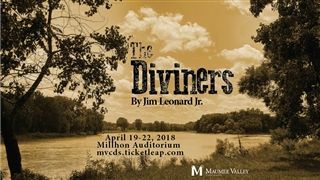 The Drama Department Presents "The Diviners"
Maumee Valley’s Drama department will present four performances of The Diviners by Jim Leonard Jr., in the round, with the audience on all sides at their Millhon Auditorium. Show dates are: Thursday, April 19, Friday, April 20, and Saturday, April 21 at 7:30 pm and Sunday, April 22 at 4:00 pm. Tickets are $8 for students (any age) and $10 for adults. Presale tickets are available at https://mvcds.ticketleap.com/the-diviners/. There are only 100 tickets available pre-sale for ​each night. There will be a few tickets available at the door. This marvelously theatrical play is the story of a disturbed young man and his friendship with a disenchanted preacher in southern Indiana in the early 1930s. The young man is deathly afraid of water after nearly drowning as a boy, in an accident that took the life of his mother. The preacher, set on breaking away from a long line of Kentucky family preachers, is determined not to do what he does best. As a result, he works as a mechanic for the boy’s father. The town doesn’t have a preacher and the women try to persuade him to preach – while he tries to persuade the child to wash. When the preacher finally gets the boy in the river and is washing him, the townspeople mistake the scene for a baptism. In a tragic turn of events, they descend upon the scene and, in the confusion, the boy drowns.